Motto of Costa Rica: Long live work and peace. Spending time at Finca Luna Nueva, in the rainforest of Costa Rica, we were surrounded by peace keepers, devoting their lives to the land and the preservation of one of our most precious natural resource: the rainforest. People on the land share the sacred bond they have with living in harmony with nature, through biodynamic and organic production of food, compost, and nature’s classroom in which they live. While there we met people from all over the world who gather at Finca Luna Nueva to share their knowledge of, and dedication to, creating an everlasting, sustainable, and healthy planet for generations to come: a community of peace keepers and protectors of our earth. Two unique individuals who embodied the spirit of world peace through education, generosity, and protection of our earth, are Ismael Torres Cordero and Christian Rodriguez. Ismael not only shares his encyclopedic knowledge of biodynamic food production, indigenous medicinals, and life in the rainforest, but he also treated us to an experience in chocolate making, direct from the cacao tree to a delicious cup of hot cocoa and organic chocolate bars. Through Ismael we were led to our newest Children of Peace. 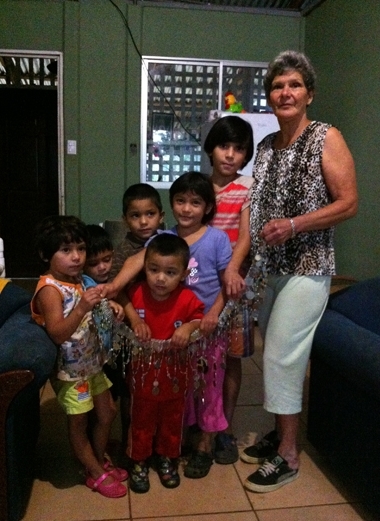 Although education is free in Costa Rica, AFWP will help provide food and necessities to the 7 beautiful children being raised by their grandparents after the sudden death of their mother. The children range in age from 2 to 16 years. Thank you Joe and Sharone Tannenbaum, for telling us about this gem of a place deep in the rainforest.